It's only by accident that the public knows about a perilous maintenance lapse on an Allegiant Airlines jet that could have resulted in tragedy. The Federal Aviation Administration investigated the incident, found critical mistakes by the company hired to do the maintenance and then covered up its own findings. The troubling episode undermines confidence in the FAA, which should be forthcoming and transparent when public safety is at stake. Pilots of an Allegiant jet leaving Las Vegas in mid 2015 aborted takeoff at 138 mph when the plane's nose started lifting up, out of their control. A part connecting the cockpit controls to the plane's elevators had slipped out of place. If that had happened in the air, the pilots would have lost control. 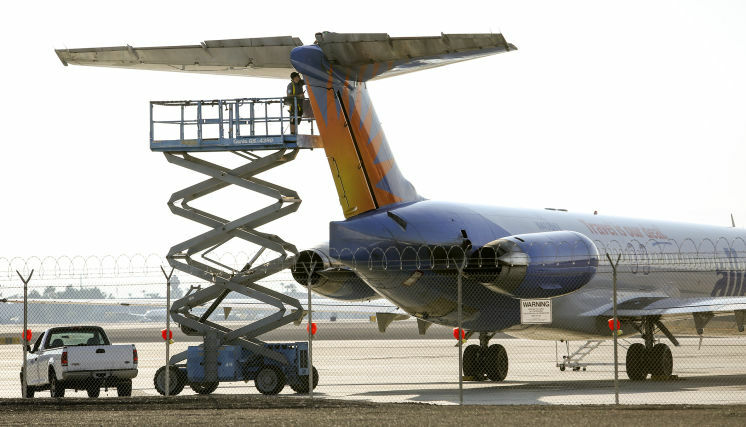 Inspectors with Allegiant and the FAA concluded that a piece holding the component together had never been installed when maintenance was performed on the aircraft three months earlier — one small indication of larger problems at AAR Aircraft Services, the national aviation maintenance company that did the work. The FAA's investigator dug further and found that AAR technicians sometimes performed only perfunctory inspections or skipped them altogether and slammed their conduct as reckless and careless, fueled by a company culture that is indifferent to its own errors. Despite the inspector's recommendation that the company be fined the maximum amount, higher-ups at the FAA saw no need for such a harsh sanction. AAR had already made adequate fixes, in their view. Those included requiring workers to watch safety videos and adding a third inspector to check work when two others failed to notice lapses — hardly the serious corrective measures that are warranted when critical safety steps are being bypassed. That leniency mirrors the FAA's general oversight of Allegiant, which has a well-documented record of mechanical failures. A Tampa Bay Times analysis last year found that Allegiant's planes were four times as likely to fail during flight as those operated by other major U.S. airlines. The FAA was content to let the airline police itself and didn't fine or sanction Allegiant, which handles more than 95 percent of passenger traffic at St. Pete-Clearwater International Airport. This incident, however, is bigger than just Allegiant — AAR does maintenance work for many major airlines as well as the federal government. And yet none of this would be known except that the FAA accidentally sent its full unredacted investigative file to Times reporter Nathaniel Lash after refusing to produce the full record. What the FAA knowingly provided blacked out its inspector's most critical findings from the public. Did the FAA try to keep that information secret to protect AAR, or because it wanted to conceal its own slap-on-the-wrist handling of the incident? Whatever the reason, the FAA's secrecy is at odds with its core mission of protecting the flying public. There is plenty of blame to go around in assessing the near-tragedy of Allegiant Flight 436. The airline has too many incidents of mechanical failures and unexpected landings. AAR cannot explain multiple lapses in standard maintenance practices that add up to a systemic problem. But the FAA looks like the worst offender because it is acting on behalf of the public to ensure the airlines are safe. The window the FAA inadvertently opened into its probe of AAR — in which it reversed the recommendation of its own veteran inspector — raises questions about how vigorously the agency is enforcing safety standards across the industry. The Canadian government said Thursday it was reviewing potential defense deals with Boeing Co. in the wake of U.S. trade officials launching a probe into alleged subsidies and unfair discounts of passenger jets made by Bombardier Inc. The Commerce Department said it could introduce tariffs as soon as this year on the Bombardier CS100 jets, drawing a strong rebuke from Canada’s foreign minister after a move that inflamed already simmering trade tensions between the two nations that could impact a multibillion-dollar sale of Boeing combat jets. The Commerce Department investigation followed a complaint in April from Boeing alleging Bombardier was “dumping” its new CSeries jet with customers including Delta Air Lines Inc. in an effort to win market share, harming the U.S. company and domestic workers. Canadian Foreign Minister Chrystia Freeland said the government “strongly disagrees” with the department’s decision and added it is now reviewing current military procurement that relates to Boeing. 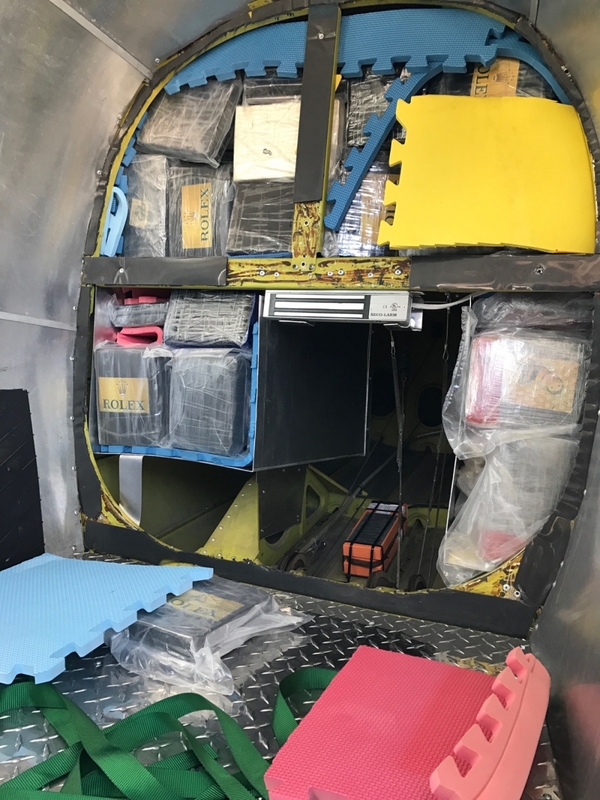 “Boeing admits it does not compete with exports of the CS100 aircraft, so it is all the more difficult to see these allegations as legitimate,” she said in a statement. The Boeing charge has been widely criticized by many aviation analysts as plane makers routinely sell initial aircraft at below-cost prices to win market traction, while Bombardier is offering a jet with little or no overlap to the U.S. company’s own products. Analysts had also warned Boeing’s push against Bombardier could backfire by upsetting Delta—which is also a big Boeing customer—as well as the potential sale of 18 of the company’s F/A-18 Super Hornet jets to Canada. Ms. Freeland didn’t identify the jet talks, but it is the only large-scale contract the country is discussing with Boeing. Canada’s potential purchase of the planes and sales to Kuwait and Qatar are central to extending the life of Boeing’s combat-jet production lines. The Commerce Department announced its investigation during a hearing about the charges at the International Trade Commission before Bombardier or Delta had started their testimony, with Boeing officials still pressing their case. Bombardier has called for the case to be dismissed and said its planes don’t compete directly with the Boeing aircraft. Canada has denied it provided Bombardier with illegal subsidies. The department said its probe will run parallel with the commission’s investigation, which is due to report by June 12. If Bombardier is found to have broken U.S. rules, the Commerce Department said it could start collecting import tariffs this year. The move adds to existing trade tensions between the U.S. and Canada, centered on the lumber and dairy industries. 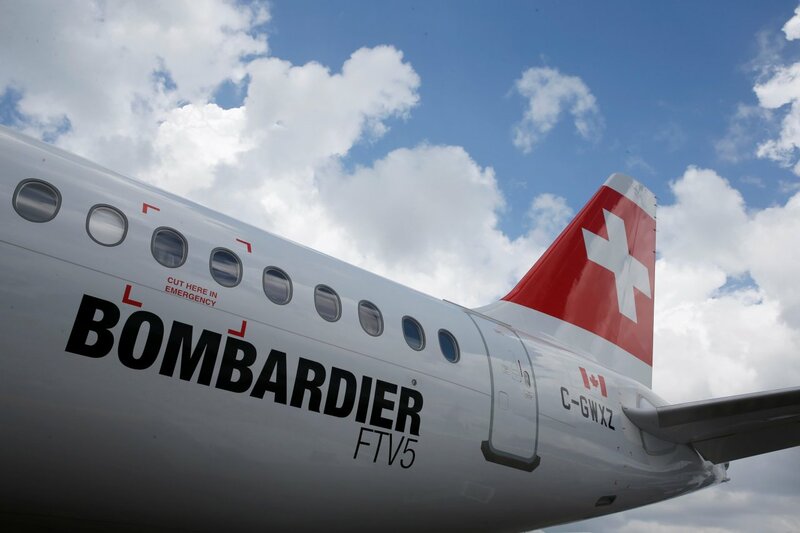 Brazil has also lodged a complaint with the World Trade Organization over Canada’s support for Bombardier, which competes with plane maker Embraer SA. Boeing wants the U.S. to impose antidumping duties on imports of Canadian passenger jets. The ITC offers a potentially quicker route than through the WTO. The U.S. and the European Union have been embroiled for years in disputes related to subsidies provided to Boeing and Airbus SE . Delta last year placed an order for 75 CSeries jets, providing the program with a marquee customer after years of sluggish sales. It is due to receive the first planes in the second half of 2018. Members of the National Transportation Safety Board and others leave after a press conference, August 1st, 2016, near the site of a hot air balloon crash that killed 16 people on July 30th, 2016 near Maxwell, Texas in Caldwell County. Family members of two San Antonio victims who died in last summer’s hot-air balloon crash that killed 16 people near Lockhart are launching a petition to the White House that calls for tougher federal oversight of balloon pilots, who are currently exempt from drug tests and medical exams. “We don’t want all those victims to have died for nothing,” said the petition’s primary author, Patricia Morgan, whose daughter and granddaughter from San Antonio both died July 30 when a commercial hot air balloon piloted by Alfred “Skip” Nichols struck high-voltage power lines. Morgan said she has little confidence the Federal Aviation Administration will do anything to make hot air balloons safer, and she had tried with no success to discuss her concerns with Sen. John Cornyn, Sen. Ted Cruz and other Texas lawmakers. The lack of a response by Cruz’s office was particularly frustrating, she said, because Cruz is a member of an aviation subcommittee that oversees the FAA. Morgan said Cruz’s deputy chief of staff, James Christoferson, finally called her Thursday morning after the San Antonio Express-News asked Cruz’s office why no one had contacted her. Morgan said Christoferson expressed his condolences and said the senator is interested in working with the FAA to enact stronger safety measures for the balloon industry. Christoferson told her no one responded to her email because a privacy form hadn’t been filled out. “I’m glad somebody has reached out,” Morgan said. But she also wondered why lawmakers aren’t already doing more. Libby Hambleton, a spokeswoman for Cornyn, said the senator’s staff members plan to speak with Morgan after learning she had tried to get in touch with them. 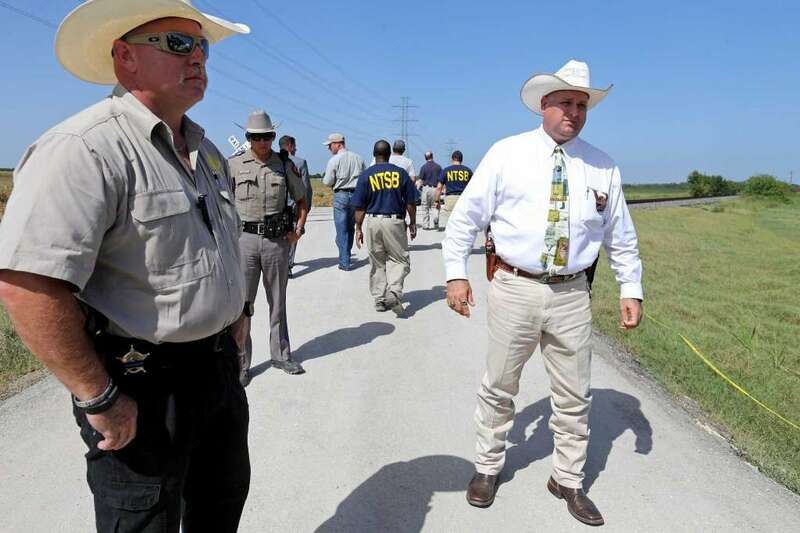 The balloon crash near Lockhart was the deadliest in U.S. history. A San Antonio Express-News investigation published in March found that hot air balloons suffer higher crash rates than other types of aircraft. But unlike most pilots, balloon pilots aren’t required to undergo drug testing or take medical exams. Nichols wasn’t legally allowed to drive a vehicle because of a string of DWI convictions and he never reported the infractions to the FAA. But even when the agency found out about his criminal history, officials didn’t discipline Nichols and they allowed him to keep his commercial pilot’s certificate. After the crash, federal investigators discovered Nichols had been on prescription medications that included oxycodone, Valium and Prozac. 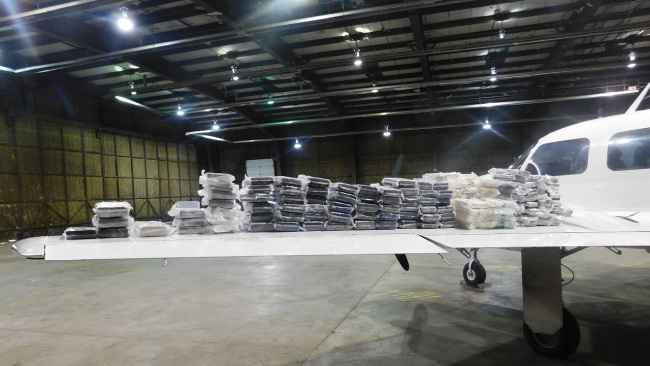 Several of those drugs had warnings not to operate heavy machinery and were prohibited by the FAA. But for balloon pilots, the agency relies on an honor system to make sure they’re fit to fly. Morgan said the petition is an attempt to prod officials to beef up FAA regulations governing balloons that date to the 1930s. Morgan’s daughter, Lorilee Brabson, and her granddaughter, Paige Brabson, died in the balloon crash. The White House’s online petition system, called “We the People,” was launched by the Barack Obama administration in 2011 and touted as a way for the public to draw attention to important issues. If a petition received 100,000 signatures within 30 days, it often received an official response. But it’s unclear whether the Trump administration will respond to future petitions or even continue the program. President Donald Trump also signed an executive order in January requiring federal agencies such as the FAA to eliminate two regulations for every regulation they enact. Before the crash, the FAA had rejected calls by the National Transportation Safety Board and FAA safety inspector Wayne Phillips to increase oversight of commercial hot air balloons, some of which can carry enough passengers to fill a commuter plane. Two lawmakers have called for greater oversight of the balloon industry and have openly criticized the FAA: Texas state Rep. John Cyrier, R-Lockhart, and U.S. Rep. Lloyd Doggett, D-Austin. Morgan said she hasn’t yet spoken with them but plans to send them the petition. Morgan said she doesn’t know if the Trump administration will take the petition seriously. But if it helps prod officials to make ballooning safer, she said it’s worth a try. “What else can we do?” she asked. On July 30, 2016, about 0742 central daylight time, a Balony Kubicek BB85Z hot air balloon, registration N2469L, crashed into a field after striking high voltage powerlines near Lockhart, Texas. The 15 passengers and pilot onboard were fatally injured and the balloon was substantially damaged due to impact forces and post-crash fire. The flight was operating under 14 Code of Federal Regulations Part 91 as a sightseeing passenger flight. The Alexandria neighborhoods of Villamay, Mason Hill, Hollin Hills, Hollindale, Kirkside and Marlan Forest are directly affected by airplanes using the NextGen RNAV departure flight tracks (shown in red lines). Mount Vernon — Mary Tracy, a retired foreign service officer from Hollin Hills, can't sit on her porch in the morning due to the piercing airplane noises flying over her community from Reagan Airport (DCA). The homes in her historic community have single pane glass, she said, so when the planes are as low as 1,800 feet, they rattle the walls (as high as 90 db) and leave her pictures hanging crooked. Sometimes there are as many as 20 planes an hour. "It's pretty deafening here when they're flying over here. It's very disturbing and it goes on past 11 p.m. They start sometimes at 6 a.m. It's a very loud and disturbing," she said. To make matters worse, she said the Federal Aviation Administration (FAA) has refused to listen to the people south of Reagan Airport and her local state legislators seem to be missing in action. Since April 2015, the problem has only gotten worse for people living south of Reagan Airport in Alexandria and Mount Vernon. That's because the FAA's NextGen procedures changed airplane departure flight tracks in those neighborhoods. Before, the flights were more spread out, but now they are concentrated over a few neighborhoods. The hardest hit areas are Hollin Hills, Villamy, Mason Hill, Hollindale, Kirkside and Marlan Forest. To deal with this problem, there's a new group of residents in the Fort Hunt area that have formed the South Flow Alliance (SFA), which aims to get the FAA to address chronic airplane noise over their neighborhoods. On Wednesday, May 10, a crowd of 100 people got briefed on this problem at the SFA Community Action Meeting at Walt Whitman Middle School. "I live in Riverside Gardens and I hear planes at all times in the day or night and I've never heard it like it is today," said Mount Vernon District Supervisor Dan Storck of the 300-plus daily departures at Reagan Airport per month — a number that exceeds that of Dulles Airport (IAD). He said the number changed radically two years ago when NextGen changed the flight paths without giving any public input on the matter. Storck added: "And that to me is unacceptable; it's wrong to impose something on a community that is a Democratic republic. Officials should be coming to us when they're making changes this dramatic. We have to try to address this situation at hand, which is totally broken and needs fixed. This cannot continue. We're going to work hard but we need your help to get there; it won't happen without your calling, your emails, by contacting the FAA with your frustrations. It will happen because the people in this community will not let this stand." 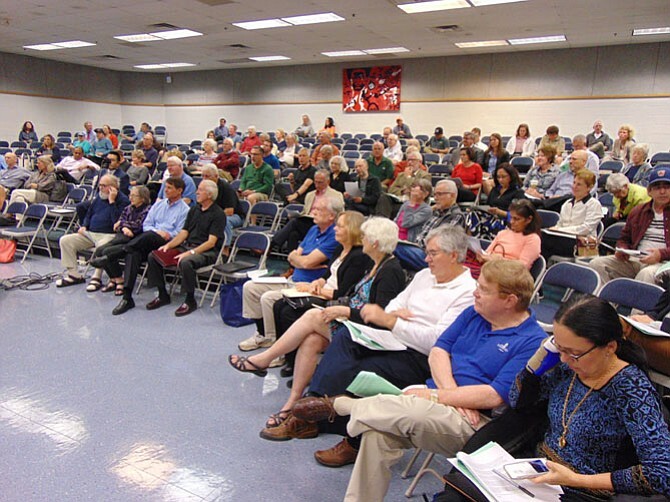 Mike Rioux, the Mount Vernon District representative to the Metropolitan Washington Airports Authority (MWAA) Reagan National Airport Community Working Group, was invited to give a PowerPoint presentation to the group on airplane traffic and noise. Before April 2015, the navigation was radar based, he said, so the noise was spread over a wider path. When NextGen came in, the flight path narrowed. So now more flights are flying in concentrated tracks. Rioux said before there was "equal opportunity noise" spread out over a wider area. "Now we have a real concentrated set of flight tracks over a specific community," he said. What NextGen is doing is consolidating the airplanes into a single on-ramp so what ends up happening is that 20 percent of the community is getting bombarded with noise and airplane congestion on designated flight paths, he said. "When it was radar based, it was a wide path over the city and affected a lot of communities; they were sharing the pain. 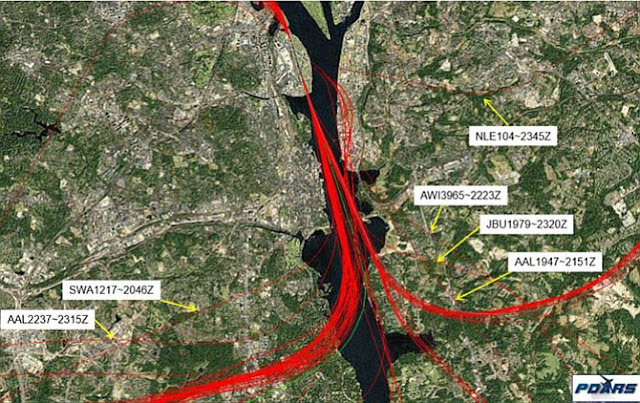 But when GPS came in, the flight path narrowed and became more concentrated," said Stephen Thayer, the City of Alexandria's representative to the Metropolitan Washington Airports Authorities Community Noise Working Group. In Old Town, Thayer said the flight paths that now exist take aircraft over the west bank of the Potomac River. More concentrated flights are flying over Old Town, then down south to the Woodrow Wilson Bridge, and then westerly. He said the southerly departing aircraft are the noisiest and that the Working Group recommended changes to the FAA to move the flight path from the west bank of the Potomac to the middle of the river. Another recommendation was for the waypoint to be extended another three miles south. "If they extend it, then planes will not anticipate making a turn and going over residential neighborhoods, which is what they're doing," said Thayer. "It will be at a higher altitude when they make the turn so it won't have the noise impact that it has now." "This is not a simple problem," said Rioux, adding that when Congress passed the 2012 FAA Modernization and Reform Act mandating NextGen, they made no requirement or opportunity for public comment, so they are exempt from community outreach. "It's really archaic," he added. Friederike Aherns, chairperson of the SFA, said the FAA did absolutely no community outreach when they implemented these flight patterns in April 2015. "We need to let the FAA know that this is not OK," she said. Some people are complaining, but Aherns said that 80 percent of noise complaints are coming from just 20 individuals, which is not enough to make changes. So she encouraged the crowd to join the SFA to make their voices heard. In the last five years, traffic at Dulles Airport has decreased while traffic at Reagan Airport is going up because its proximity to the District makes it more convenient for travelers, said Rioux. "DCA is a slot-controlled airport; you pay for a slot and can fly as many flights out of there as possible; there are no restrictions. The traffic is going to continue to grow here (at Reagan Airport)." Rioux said 56 percent of airplane departure traffic goes north; 44 percent goes south. In 2004, he said the FAA did a Noise Contours Part 150 Study that drew noise contours, which tells the average level of noise around Reagan airport. About three years ago, it updated those noise contours because they made some modifications to the airport. "We've got to redo the noise footprints. We're still fighting that issue," he added. In recent months, the FAA has been focused on the North Flow traffic above Reagan Airport, said Rioux. The South Flow traffic has not gotten any attention; and Rioux doesn't expect the FAA to address it until July or August. So now is the time for people to get active. For those who want to track airplanes and noise flying above their properties and report them, Rioux suggests doing a Google Search of "DCA Webtrak," the flight track and noise public portal for Reagan Airport. By clicking on the airplane icon, it will give you info on the flight activity, noise data, speed, and altitude. Then you can keep track of what's flying overhead. What can local residents do now? Don Minnis, the alternate representative for Mount Vernon on the MWAA Reagan National Airport Community Working Group, said people should get involved with the SFA because it specifically represents the Fort Hunt Corridor from Belle Haven down to Mount Vernon. Pamela Norton of the SFA said they are in the process building a grassroots momentum and need more people to participate. "We want a solution that incorporates all of us … We need numbers. We need to make all of our concerns known. We need to put our heads together and need to unite." She urged people to participate in one of the SFA Committees: Community Outreach Committee; Coordination Committee; Data Collection Committee; Mobilization and Legal Research. Call or write elected officials to show them that the issue concerns many of their voters and deserves immediate attention. Write a letter to the editor to the local paper or an opinion piece in neighborhood newsletters. Become an active member of SFA by signing up with one of the committees. Rioux said noise complaints should also be submitted to the MWAA on-line by going to http://www.flyreagan.com/dca/reagan-national-submit-noise-complaint. He said while a response to a noise complaint is unexpected, submitting a complaint helps document and underscore the noise impact that flights have on our communities. It also helps support the efforts of the community representatives on the MWAA Community Working Group to affect changes to flight procedures. "Many of our elected officials including Congressman Don Beyer, Delegate Paul Krizek and Mount Vernon Supervisor Dan Storck Residents have been actively engaged in addressing the noise impact with the FAA and their efforts have been impactful. However, residents should also express their opinion and concerns through letters or emails to other elected officials including Senators Kaine and Warner and state Senator Scott Surovell. Residents of Alexandria City should also take the same action with their elected officials," he said. "Legitimate and documented noise complaints are data points that help drive change," he added. FedEx Corp.’s president and other top execs from U.S.-based passenger and cargo carriers recently questioned the practices of so-called "legacy" airlines. David Bronczek, president and COO of FedEx; William J. Flynn, president and CEO of Atlas Air Worldwide; Robin Hayes, president and CEO of JetBlue Airways; and Mark B. Dunkerley, president and CEO of Hawaiian Airlines Inc., signed a letter dated May 15 that outlined their pro-global network stance on U.S. Open Skies agreements and called out Delta Air Lines, American Airlines and United Airlines. The companies comprise a coalition known as the U.S. Airlines for Open Skies (USAOS); the letter was sent to Ambassador Robert Lighthizer — the newly confirmed U.S. Trade Representative. Open Skies agreements are treaties that allow for unrestricted air travel between countries. These agreements are intended to eliminate government interference in commercial activity, which the USAOS believes promotes job growth, reduces prices for airline passengers, facilitates U.S. exports, strengthens U.S. national security and encourages competition in the airline sector. The group's letter goes on to say that legacy carriers are circumventing the International Air Transportation Fair Competitive Practices Act (IATFCPA). The act allows the U.S. Department of Transportation (DOT) to take action if anti-competitive, discriminatory, predatory or unjustifiable activities by a foreign government or foreign airlines occur against a U.S. airline. The DOT has 180 days from the time the complaint is filed to either act to resolve the matter, dismiss the complaint or resolve it through diplomatic actions. The Partnership for Open & Fair Skies — a coalition of American, Delta, United, the Air Line Pilots Assoc. Int’l, the Allied Pilots Assoc., the Airline Division of the International Brotherhood of Teamsters, the Assoc. of Flight Attendants-CWA, the Assoc. of Professional Flight Attendants, the Communications Workers of America and the Southwest Airlines Pilots’ Assoc. — wrote its own open letter to President Donald Trump in March that asked his administration to address alleged trade violations by the United Arab Emirates (UAE) and Qatar, which it claimed threatened 1.2 million American jobs. But, according to the USAOS documents, the legacy carriers have not filed a complaint under the IATFCPA and instead have tried to “persuade policymakers” via lobbying and media efforts. A three-page bulleted list of statements to support the USAOS’s position was also included. The private pilot was conducting a personal cross-country flight. The pilot's friend reported that he provided weather information to the pilot about 1 hour before the flight; no record was found indicating that the pilot or the friend obtained a formal weather briefing before he departed for the night cross-country flight. A review of weather information revealed that, about 1 hour 20 minutes into the flight, as the airplane was nearing the destination airport, it encountered a strong cold front boundary with associated severe wind shear and turbulence. Review of radar data revealed that, during the following 13 minutes, the flight completed numerous course deviations, including three complete left circuits and two right circuits, before impacting wooded terrain. Review of the last 3 minutes of radar data revealed that the airplane's altitude oscillated between 2,100 and 200 ft mean sea level (msl) as it completed the two right circuits and one of the left circuits before it impacted terrain. The last target was recorded about 2,000 ft southeast of the accident site at an altitude of 525 ft msl. Examination of the wreckage did not reveal any preimpact mechanical malfunctions or failures that would have precluded normal operation. Based on the evidence, it is likely that the airplane encountered wind shear and turbulent conditions upon encountering the strong cold front boundary and that the pilot subsequently lost airplane control. The pilot's inadequate preflight weather planning and in-flight weather evaluation, which resulted in an encounter with a strong cold front and the pilot's subsequent loss of airplane control. On November 19, 2016, about 1902 eastern standard time, a Ryan Navion A, N4976K, impacted wooded terrain while maneuvering near New Gretna, New Jersey. The private pilot was fatally injured, and the airplane was substantially damaged. The airplane was registered to and operated by the private pilot as a 14 Code of Federal Regulations Part 91 personal flight. Night visual meteorological conditions prevailed, and no flight plan was filed. The flight originated from Hummel Field (W75), Saluda, Virginia, about 1730, destined for Ocean County Airport (MJX), Toms River, New Jersey. The day before the accident, the pilot flew uneventfully from MJX to Accomack County Airport (MFV), Melfa, Virginia for an overnight visit with a friend who was also a pilot. On the day of the accident, both pilots flew their airplanes to W75 for dinner. After dinner, they both fueled their airplanes and about 1730, they departed for home (the pilot to MJX and the friend to MFV). While en route, they communicated with each other on their radios. During approach to MFV, about 1805, the friend experienced wind shear and performed a missed approach. He advised the pilot of the strong wind conditions, which he acknowledged. The friend radioed the pilot again about 1830 to check on him, and he replied that he was okay and had reached the Delaware Bay. No further communications were received from the pilot. Review of weather information and radar data provided by the Federal Aviation Administration (FAA) revealed that, after departure, the accident flight proceeded on a relatively direct course until about 1849, when it encountered the leading edge of a cold front boundary. During the following 13 minutes, the flight completed numerous course deviations, including three complete left circuits and two right circuits, before impacting wooded terrain. Review of the last 3 minutes of radar data revealed that the airplane's altitude oscillated between 2,100 and 200 ft mean sea level (msl) as it completed the two right circuits and one of the left circuits before impacting terrain. The last target was recorded at 1902:36, when the airplane was about 2,000 ft southeast of the accident site at an altitude of 525 ft msl. The pilot held a private pilot certificate with an airplane single-engine land rating. He did not have an instrument rating. His most recent FAA third-class medical certificate was issued on May 7, 2015. At that time, he reported a total flight experience of 800 hours. The pilot's logbook was not recovered. The four-seat, low-wing, retractable tricycle-gear airplane was manufactured in 1949. It was powered by a 205-horsepower Continental E-185 engine and was equipped with a constant-speed Hartzell propeller. The pilot purchased the airplane in 1993. Review of maintenance records revealed that the airplane's most recent annual inspection was completed on July 12, 2016. At that time, the airframe had accumulated about 3,501 total flight hours, and the engine had accumulated about 548 hours since major overhaul. According to the tachometer, the airplane had flown about 23 hours from the time of the annual inspection until the accident. The pilot's friend reported that he had obtained a weather briefing about 1630 via flight service for both his and the pilot's flights. The friend added that he told the pilot that the weather was forecast to deteriorate near his destination airport between 1900 and 1930; however, a search of flight service records did not reveal any contact from either pilot's airplane registration numbers on the day of the accident. Additionally, the friend reported that he plotted a route on the pilot's iPad using a Garmin Pilot app, which overlaid weather information; however, a search of ForeFlight and Garmin did not reveal any current subscriptions for the pilot. MJX was located about 16 miles northeast of the accident site. At 1856, the recorded weather at MJX was wind from 150° at 5 knots, visibility 3 statute miles in mist, sky clear, temperature 12°C, dew point 12°C, and altimeter setting 29.64 inches of mercury. Atlantic City International Airport (ACY), Atlantic City, New Jersey, located about 14 miles southwest of the accident site. At 1730, the recorded wind at ACY was from 290° at 24 knots, gusting to 31 knots. Further review of weather data revealed multiple area forecasts for a strong cold front moving through the area with associated severe wind shear and turbulence (for more information, see the Weather Study in the public docket for this accident). A debris path, beginning with freshly cut tree branches and a section of right stabilizer tip and right elevator, extended about 420 ft on a magnetic heading north of the main wreckage. The right and left flaps, left wing tip, left aileron, and cabin roof were located about 340 ft along the debris path. The right aileron and left stabilizer tip were located about 390 ft along the debris path. The main wreckage was inverted at the end of the debris path with both wings separated. The right main landing gear and nose landing gear remained attached to the airframe and were observed in the extended positon. The left main landing gear had separated, and the landing gear tire was located next to the main wreckage. The empennage and rudder remained attached to the airframe. The wreckage was transported to a recovery facility for further examination. Aileron control continuity was confirmed from the cockpit area to the wing roots, where the left and right aileron cable ends exhibited broomstraw separation, consistent with overload. Continuity was also confirmed from the cockpit area to the empennage area, where the elevator and elevator trim cables exhibited broomstraw separation, consistent with overload. The rudder cables exhibited cuts consistent with recovery of the wreckage. The propeller remained attached to the engine. Both propeller blades exhibited S-bending, chordwise scratching, leading edge gouging, and tip curling. Due to an impact fracture at the front of the engine crankcase, the propeller could only be rotated about 90°. Using a lighted borescope during rotation, crankshaft continuity was confirmed to the pistons, and camshaft continuity was confirmed to the cylinder valves. Both magnetos sparked at all leads when rotated by hand. Throttle control continuity was confirmed to the throttle lever at the carburetor. Mixture control continuity was confirmed to the mixture lever at the carburetor, where the mixture lever was impact separated. 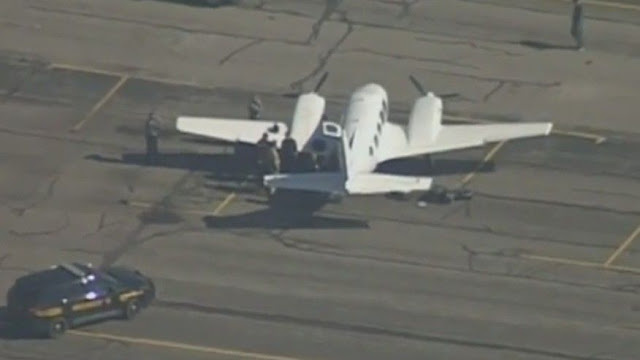 The Burlington County Medical Examiner, Mount Holly, New Jersey, conducted an autopsy on the pilot. The autopsy report noted the cause of death as "multiple injuries." The FAA's Bioaeronautical Science Research Laboratory, Oklahoma City, Oklahoma, conducted toxicological testing on specimens from the pilot. The results were negative for alcohol and drugs. On November 19, 2016, about 1902 eastern standard time, a Ryan Navion A, N4976K, was substantially damaged when it impacted wooded terrain, while maneuvering near New Gretna, New Jersey. The private pilot was fatally injured. The airplane was registered to and operated by the private pilot as a personal flight conducted under the provisions of 14 Code of Federal Regulations Part 91. Night visual meteorological conditions prevailed and no flight plan was filed for the planned flight to Ocean County Airport (MJX), Toms River, New Jersey. The flight originated from Hummel Field (W75), Saluda, Virginia, about 1730. 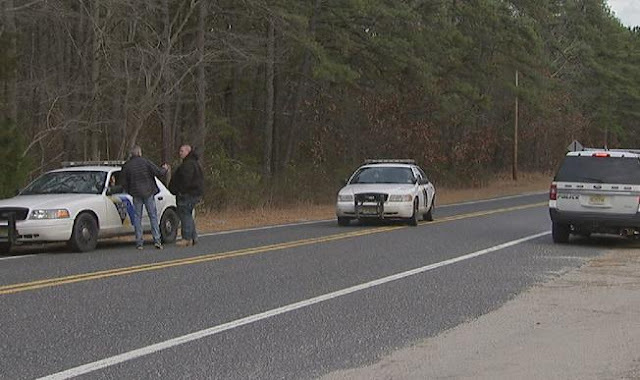 A friend of the accident pilot, who was also a pilot, owned a second home near Accomack County Airport (MFV), Melfa, Virginia. The accident pilot flew uneventfully from MJX to MFV during the day prior to the accident, for an overnight visit. On the day of the accident, both pilots flew their respective airplanes to W75 for dinner. After dinner, they both fueled their airplanes before departing for home (the accident pilot to MJX and the friend to MFV) about 1730. While enroute, they communicated with each other on frequency 123.45 MHz. During approach to MFV, about 1805, the friend experienced windshear and performed a missed approach. He advised the accident pilot of the strong wind conditions, which the accident pilot acknowledged. The friend radioed the accident pilot again about 1830 to check on him. The accident pilot replied that he was okay and had reached the Delaware Bay. 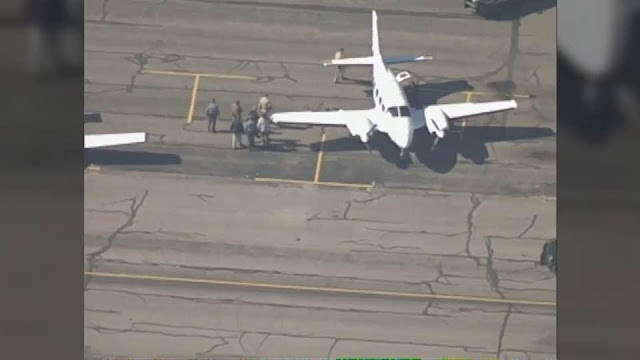 No further communications were received from the accident airplane. Review of preliminary radar data provided by the Federal Aviation Administration (FAA) revealed that the accident flight proceeded on a relatively direct course until approximately 1849, when it encountered the leading edge of a cold front boundary. During the following 13 minutes, the flight completed numerous course deviations, including three complete left circuits and two right circuits, before impacting wooded terrain. A debris path was observed; beginning with freshly cut tree branches and a section of right stabilizer tip and right elevator, and extended approximately 420 feet on a magnetic heading of north to the main wreckage. The right and left flaps, left wingtip, left aileron, and cabin roof were located about 340 feet along the debris path. The right aileron and left stabilizer tip were located about 390 feet along the debris path. The main wreckage was inverted at the end of the debris path, with both wings separated. The right main landing gear and nose landing gear remained attached to the airframe and were observed in the extended positon. The left main landing gear had separated and the landing gear tire was located next to the main wreckage. The empennage and rudder remained attached to the airframe. The wreckage was retained for further examination. The pilot, age 75, held a private pilot certificate with a rating for airplane single-engine land. He did not possess an instrument rating. His most recent FAA third-class medical certificate was issued on May 7, 2015. At that time, he reported a total flight experience of 800 hours. The four-seat, low-wing, retractable tricycle-gear airplane, serial number NAV-4-1976, was manufactured in 1949. It was powered by a Continental E-185, 205-horsepower engine, equipped with a constant-speed Hartzell propeller. The pilot purchased the airplane in 1993. Its most recent annual inspection was completed on July 12, 2016. 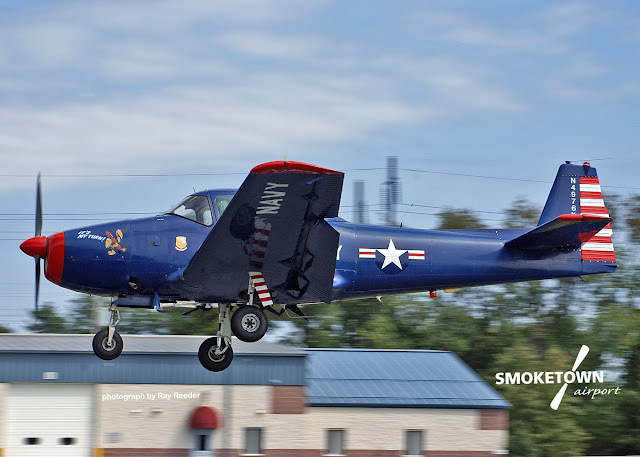 At that time, the airframe had accumulated approximately 3,501 total hours of operation and the engine had accumulated about 548 hours since major overhaul. The MJX airport was located about 16 miles northeast of the accident site. The recorded weather at MJX, at 1856, was: wind from 150 degrees at 5 knots, visibility 3 miles in mist; sky clear; temperature 12 degrees C; dew point 12 degrees C, altimeter 29.64 inches Hg. Atlantic City International Airport (ACY), Atlantic City, New Jersey, was located about 14 miles southwest of the accident site. The recorded wind at ACY, at 1730, was from 290 degrees at 24 knots, gusting to 31 knots. 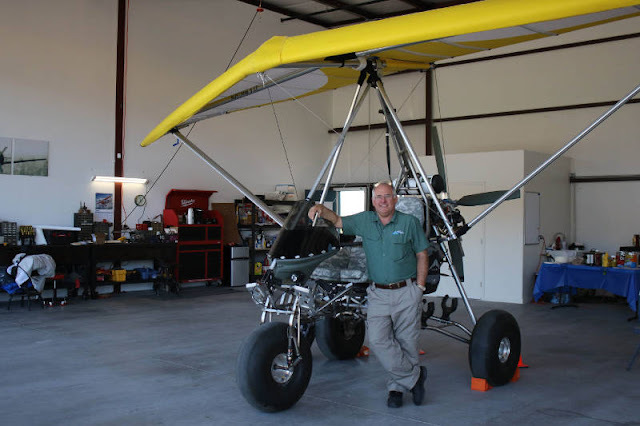 Owned by Cottonwoodbased Kestrel Aviation, the Wild Sky Aircraft’s Goat is a combination of hang glider, fan-powered go-kart and all-terrain vehicle. The 80-horsepower engine and fabric-and-strut wings lift the 575-pound aircraft into the air at 45 miles per hour, after a 200-foot runway takeoff. Once in the air, the Goat cruises at about 55 mph and tops out at just under 70 mph. Landing at 35 mph requires about 400 feet of open space. Thanks to over-large tundra tires and sport-tuned suspension, the Goat can land on a variety of terrain, including desert meadows, fields, beaches and gravel bars. It can also be outfitted, Kestrel Aviation CEO Sid Lloyd said, with pontoons for water access or skis for snow allowing its two passengers access to many backwoods locations typically inaccessible to aircraft. The Goat features a 16-gallon tank and runs on regular gasoline, averaging about three gallons per hour. Perhaps the most interesting part of the aircraft is the way it’s steered: Unlike traditional planes, it is a weight-shifted craft. The pilot grips a handlebar that shifts the angle of the wing. For experienced pilots, it takes a couple hours to acclimate, as all of the controls are backward in comparison to traditional aircraft. Lloyd, who opened up shop at Cottonwood Municipal Airport on Saturday, May 20, said that he founded Kestrel Aviation specifically to appeal to pilots, formerly licensed pilots and would-be pilots who want to apply for the recently designated Light Sport Aircraft license and potentially purchase and license their own aircraft. Light Sport Aircraft have been defined by the Federal Aviation Administration as two-passenger aircraft that weigh less than 1,320 pounds and reach a top speed of 120 mph. Concurrent with the development of the Light Sport Aircraft license, the establishment of the Sport Pilot license by the FAA allows pilots to “purchase a brand new aircraft and obtain training .... for less than half of what traditional aviation costs,” according to Lloyd. According to Lloyd, a resident of the Verde Valley for 10 years, Kestrel Aviation is a “one-stop shop” for this new segment of adventurous pilots. The small hangar feature a full FAA-certified Light Sport Aircraft flight center, offering maintenance and condition inspections of 3-axis and weightshift Light Sport Aircraft. Lloyd plans to partner with other Light Sport Aircraft businesses to provide a full range of services. As to an existing market for adventure trike enthusiasts in the Verde Valley — Lloyd admitted there isn’t one. Kestrel Aviation is located at 668 S. Airpark Road, Hangar No. 3 at the Cottonwood Municipal Airport. For more information visit kestrelaviationservices.com. Opening day will feature an open house in their new hangar from 10 a.m. to 3 p.m. located 668 Airpark Road, Hangar No. 3, and free hot dogs and beverages will be provided. Kestrel Aviation Services provides a “one-stop-shop” for LSA adventure, stated the release. Featured will be a full FAA LSA certified flight center, providing maintenance and condition inspections of all 3-axis and weight-shift LSA aircraft. “They are also Factory Reps for Wild Sky Aircraft, manufacturers of the incredible new LSA heavy-duty “Goat” weight-shift adventure hike. And they partner with other LSA businesses to provide a complete LSA pilot experience,” the release explained. Light Sport Aircraft have been defined by the FAA as two-place aircraft weighing less than 1,320 pounds with a top speed of 120 mph, said the company, adding that their lower weight and lower design speed make them more affordable than traditional aircraft. “The FAA worked with industry experts to develop a faster and more affordable certification process for LSA aircraft in order to accelerate development and cut cost. There are already more than 150 models of LSA aircraft on the market from which to choose,” stated the release. Along with the new LSA category of aircraft comes a new type of pilot license: Sport Pilot. A Sport Pilot license requires passing an FAA knowledge test, and a minimum of only 15 hours of dual instruction plus 5 hours of supervised solo, said the company. 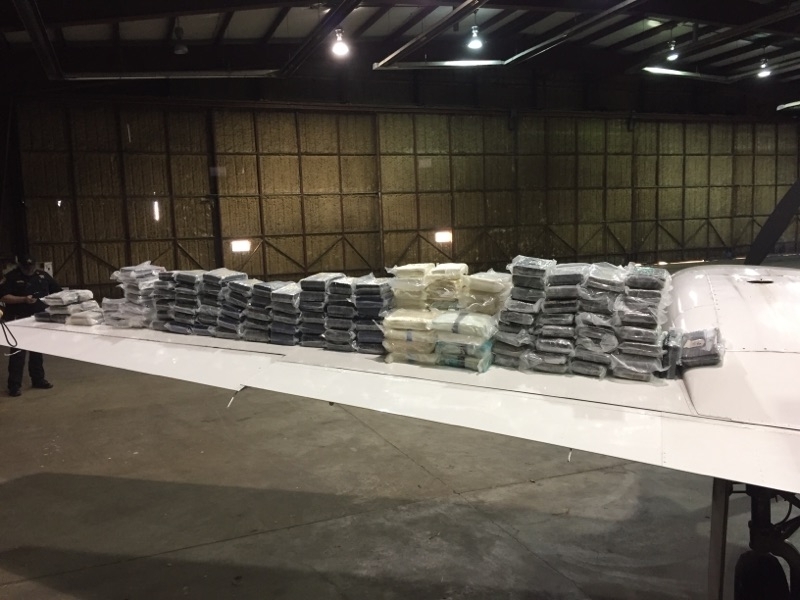 This is half of what is currently required for a full Private Pilot license, the release stated. “The limits for a Sport Pilot include no night flight, carrying only one passenger, and not flying higher than 10,000 feet. Since there are such limits, it is much easier to learn what you need to know to obtain a Sport Pilot license. And, you don’t need an expensive FAA medical certification. All you need is a valid driver’s license,” stated the release. Total training cost for a typical Sport Pilot license is under $6,000, said the company. 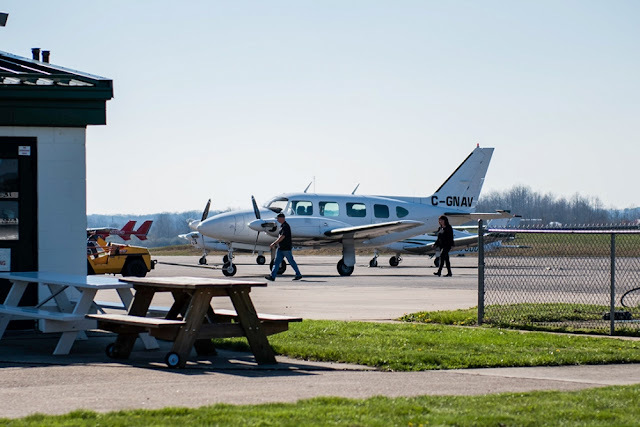 Existing Private Pilots can fly LSA aircraft as Sport Pilots without a medical certificate if they have not had their last medical revoked by the FAA, opening up aviation to thousands of existing “rusty” pilots, the release stated. “Sid Lloyd started Kestrel Aviation Services after a successful executive career with Fortune 100 companies and was most recently CEO and President of a large non-profit based in Oklahoma. He shares his love of aviation with his wife who is also a pilot. They have lived in the Verde Valley for 10 years,” stated the release. Aircraft landed on Runway 9 and struck trees off runway. Aviation officials are investigating a forced landing at the Vinton County Airport which saw a plane skid into some trees, though no injuries were reported. The plane was piloted by Nick Rupert, 67, who was joined by three other passengers. Rupert is president of the Vinton County Pilots and Boosters Club. According to the Ohio State Highway Patrol, Rupert "attempted to land after an equipment malfunction." "The plane attempted to land and traveled off the right side of the runway and struck some trees," the report states. In an interview with The Courier, Rupert said he was flying the passengers above McArthur around 4:15 p.m. when he noticed engine failure. He said he guided the plane back to the airport, which is around 7 miles north of town. Rupert takes issue with the Patrol characterizing the incident as a "plane crash." He said the landing was done safely and the plane "skidded into some trees" as a preventative measure. All were OK afterwards, he noted, other than the plane being "banged up." The other occupants were Cory Markin, 24, and Courtney Stamm, 27, both of Logan, as well as James Thompson, 65, of McArthur. Rupert is a longtime pilot at the airport who regularly offers sky tours of Vinton County. The Federal Aviation Administration is conducting an independent investigation, according to the Patrol. Rupert said FAA officials were at the airport early Thursday and would be reporting to the National Transportation Safety Board, as is standard protocol. 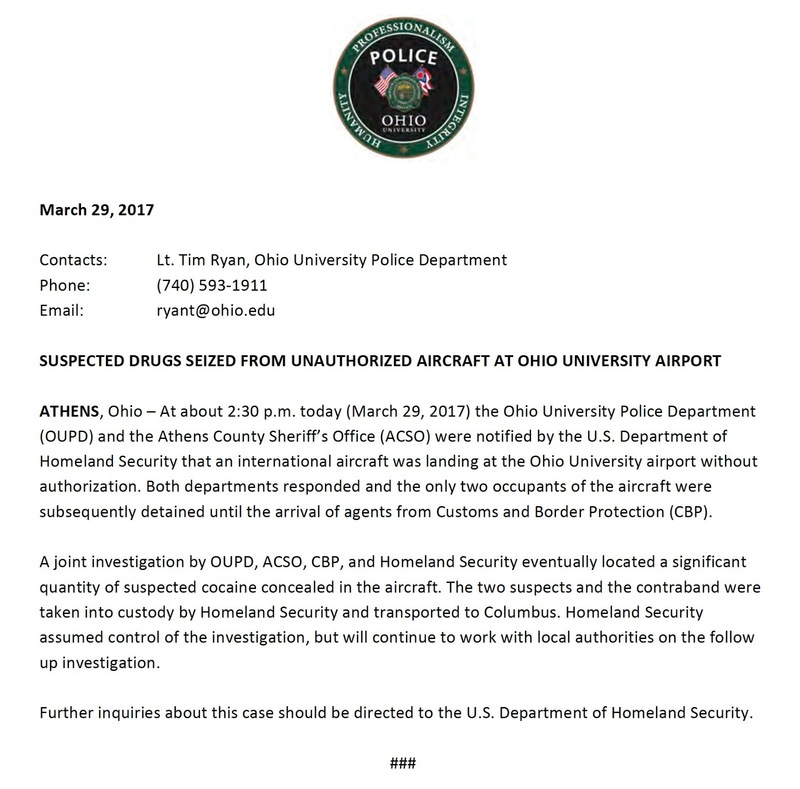 One of two Canadians aboard a plane that made an emergency landing at Ohio University’s airport with more than 290 pounds of cocaine aboard pleaded guilty Tuesday to a federal drug charge. 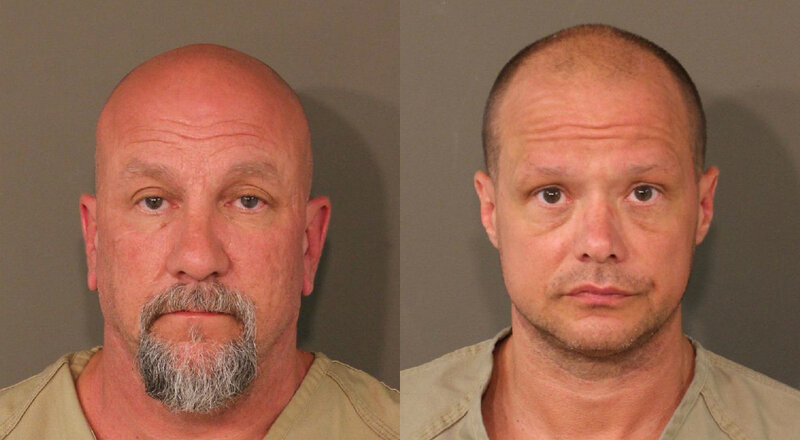 The plea agreement on behalf of David Ayotte, 45, was filed in the U.S. District Court in Columbus. The charge is possession with the intent to distribute more than five kilograms of cocaine, which carries a potential sentence of 10 years to life imprisonment and a fine up to $10 million. Ayotte was aboard the plane with Sylvain Desjardins, 47, the pilot, on a March 29 trip from Grand Bahama Island to Windsor, Ontario. The two men are from Mirabel, a suburb of Montreal. 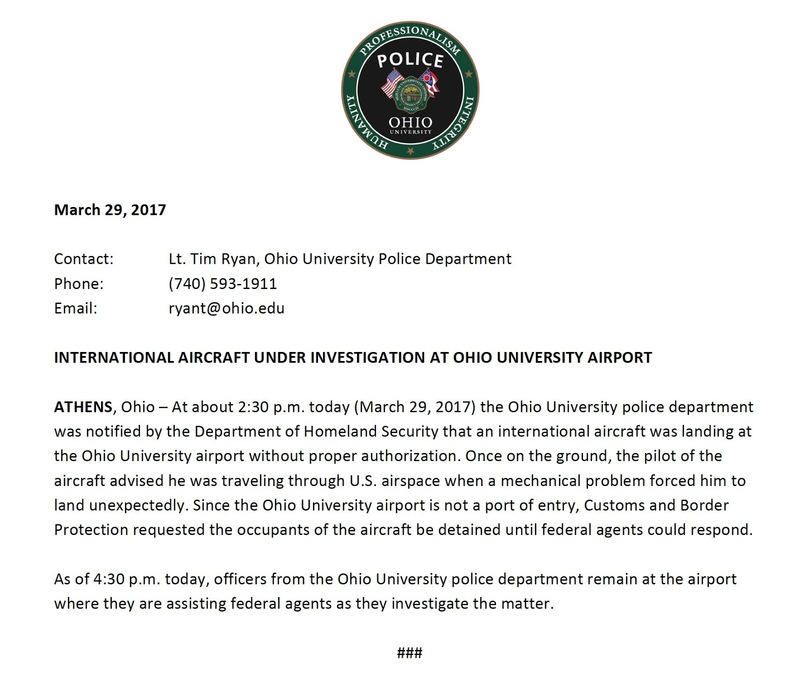 The aircraft experienced mechanical problems and the pair made an emergency landing at the Ohio University Gordon K. Bush Airport near Athens. 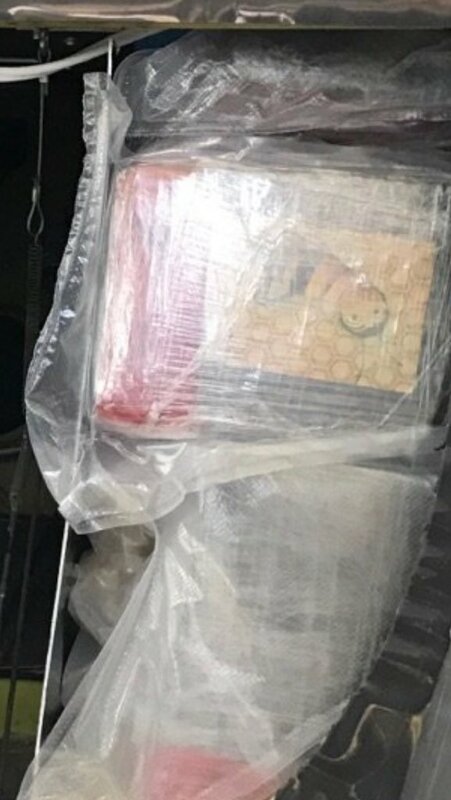 That’s where they were intercepted by Homeland Security and U.S. Customs and Border Protection agents along with campus and local law enforcement. Under the agreement, Ayotte admits to the possession of cocaine with intent to distribute charge, court records show. 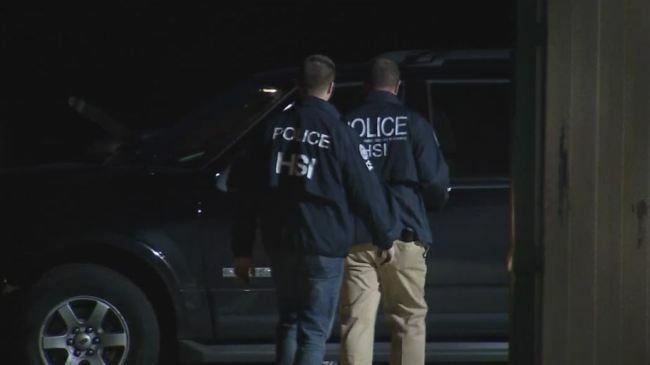 He will later appear in U.S. District Court to formally enter his plea and will later be sentenced, said Michael Hunter, an assistant U.S. Attorney. Ayotte is being held in the Delaware County Jail. The plea agreement does not say whether Ayotte will testify against the co-defendant, Desjardins, 47, who is also being held on a charge of one count of possession with the intent to distribute more than five kilograms of cocaine. Desjardins has prior convictions in Canada for trafficking in heroin and marijuana.